Why is the amount due an estimate? Not all pork chops or hams are exactly the same size and price is determined by weight. Because our products are food and vary in size/weight, we give you an estimated price when you place your order, and update the price to reflect the actual amount owing after the final packing and weighing is complete. You will be charged for only what you order and can change your order right up until the given deadline date. Do I pay as soon as I place my order? No, you do not pay until your order is picked and prepared for delivery, 1 day before delivery. You can then pay by Email Transfer, cash, credit card on-line, or with cheque (active credit card must be on file). You may choose to pay by cheque (with active credit card on file), email transfer at time of pick-up or delivery, cash, or on-line with credit card and save time on delivery day! What happens if I don't receive what I asked for? 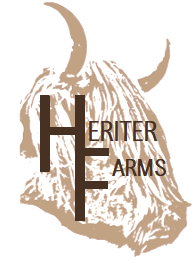 We strive to provide the best customer service possible, and all orders are checked by the Heriter Farms owner to ensure accuracy and quality before going out. In the event there is an error, we will not hesitate to make it right. Your loyalty as a customer is our main priority, because to gain your loyalty means to gain your trust and respect. Please Note: All dis-honored cheques will be charged a $45 NSF fee, and your order will be immediately charged to a credit card on file.